*Columbus Day on October 9, 2017. Report released October 10, 2017. The cost of gas continued to decline nationwide during the past week, and the pace of the declines appears to be accelerating, according to the latest fuel price survey from the U.S. Energy Information Administration. Fuel prices, which spiked in the days following the landfall of Hurricane Harvey in Texas, have continued to fall in recent weeks. The national average price for a gallon of regular unleaded is now just over $2.50, according to the E.I.A., down just over six cents from the previous week. Prices fell in all regions, with survey data showing most declines well ahead of the national average. Prices across the West Coast, however, did not fall as aggressively this week, declining between two and three cents per gallon, on average. Diesel prices dropped again this week, helping truckers. The E.I.A. report shows the national average cost of a gallon of diesel fell nearly two cents per gallon to $2.78. As with regular gasoline, most regional prices declined at a faster pace. However, prices across the Rocky Mountains remained flat on the week, according to the E.I.A. report. 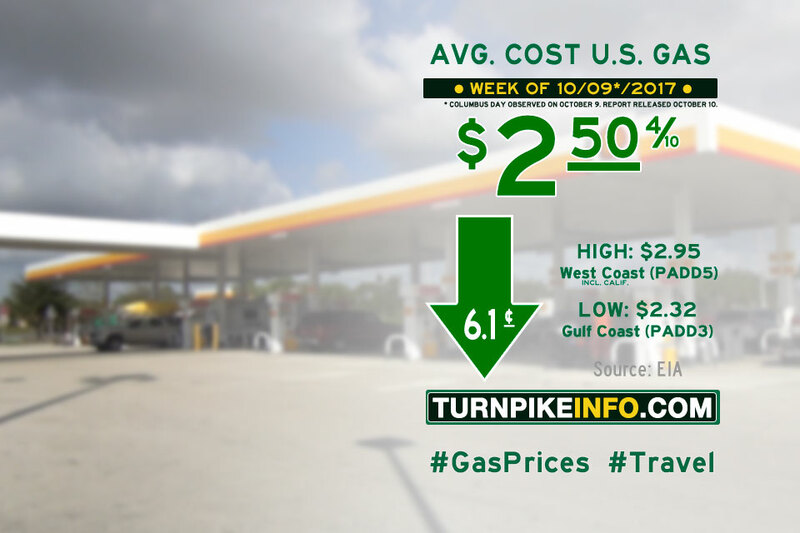 Regional cost averages for both gasoline and diesel are listed below, showing the current week and previous week. Prices are ranked from highest to lowest price.